Steinberg Law Firm Attorney Catherine Meehan with kitchen staff & Director, DJ. Charleston, SC (Law Firm Newswire) October 27, 2017 – Founded in 1927, the Steinberg Law Firm has always been a stalwart supporter of our community. For generations, our attorneys and staff have fought hard for the rights of others. In addition to working hard for our clients, the personal injury firm is committed to sponsoring organizations that strive to improve workforce development, healthcare, literacy, children’s health and children’s welfare. The Steinberg Law Firm Community Fund is dedicated to supporting the local community and is pleased to announce the next funding recipient of 2017: Meals on Wheels of Charleston (MOW), who provides hot nutritious midday meals to the elderly and other homebound adults. Attorney Catherine Meehan visited the kitchen last week to personally thank the staff for the hard work they are doing in our community. The firm will also further their commitment by volunteering with this organization on a regular basis. 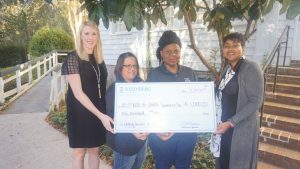 Meals on Wheels of Charleston received $1,000 to feed an individual Monday to Friday every week for a year in portions of Dorchester, Berkeley and Charleston counties. Many MOW clients live in substandard housing, have serious health conditions, and either little or no family support. Medical staff, family, friends, hospice and other human service organizations refer clients to MOW. In 2014, 807,960 seniors faced food insecurities in South Carolina making the state the eighth worst in the United States for senior hunger. MOW of Charleston delivered over 161,500 meals in 2016. Meals on Wheels of Charleston does not just provide a well-balanced, nutritious midday meal. They also offer friendship and a safety check, allowing low-income seniors and other homebound individuals to continue living independently in their own homes. According to a Meals on Wheels America survey, 92 percent of their clients say the service allows them to live on their own.